Hello! This morning (about 8 hours ago) my phone went to the Apple logo, unprovoked. I have not jailbroken it, I have not recently updated it (last few weeks, but I believe I am on current update). I have attempted to reset it, the attempt only succeeds in removing the Apple logo from my screen, it might be off, I am sure. Thank you. This thread is very popular among iPhone users. People who have tried to jailbreak their iPhone face this issue quite commonly. People always feel puzzled when iPhone stuck on Apple logo. But it’s not all that serious, you can fix the issue of iPhone stuck on Apple Logo. And here are several methods recommoned for you. The first method that users want to try may be resetting the device. People need to hold the Sleep/Wake button and the home button at the mean until you see the Apple logo again, and then release the button. This simple method may be helpful when your iPhone get stuck on Apple logo by mistake. But some iPhone users get no luck when they try the method above, they only get the loops between the black screen and the Apple logo. At this moment, the users will need to restore their iPhone with the computer. The following guidance will show you how to do it. Turn off iPhone. If you can’t turn it off, just hold the Sleep/Wake button and the home button at the mean time for a few seconds. Plug your iPhone into computer via the USB cable, and hold the home button when you connect iPhone to computer. When you see the “Connect to iTunes” screen, release the home button. If you don’t see the screen, just repeat the steps above for another time. Then you will get the notice: “iTunes has detected an iPhone in recovery mode. You must restore it before it can be used with iTunes”. Then restore iPhone with iTunes. If your iPhone is stuck on Apple logo, this method may also be useful. But sometimes you may only enter the recovery mode by mistake. At this moment, you can restart your iPhone to exit the recovery mode, or wait for 15 minutes, and then the device will exit the recovery mode itself. Of course, iTunes will erase all the contents and settings on your iPhone after you restored the device. You may lose the newly added data in your iPhone, and you will have to restore the iPhone with the backup. When iPhone is stuck on Apple logo, the users may have no other good ways to do except for restoring iPhone. So this also reminds us of the importance of updating iPhone backup. In our daily life, we may also experience the data loss occasionally and don’t want to use iTunes because we don’t want to lose the newly added data. At this moment, a piece of iPhone data recovery software will provide much help. 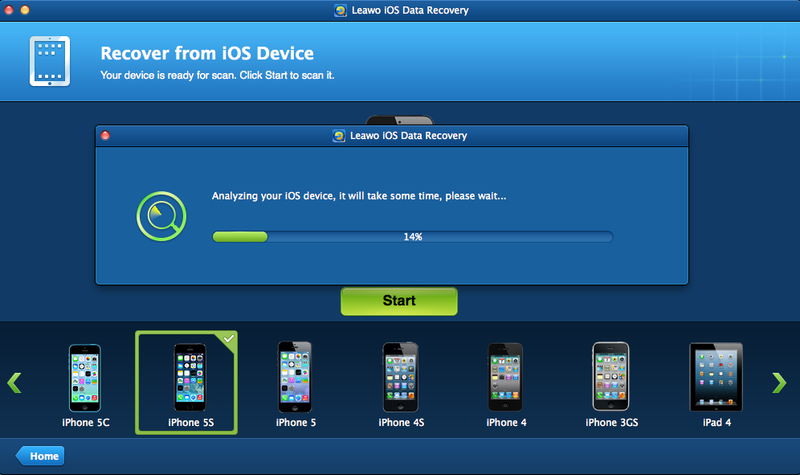 Among all the iPhone data recovery programs, Leawo iOS Data Recovery can be regarded as one of the best. 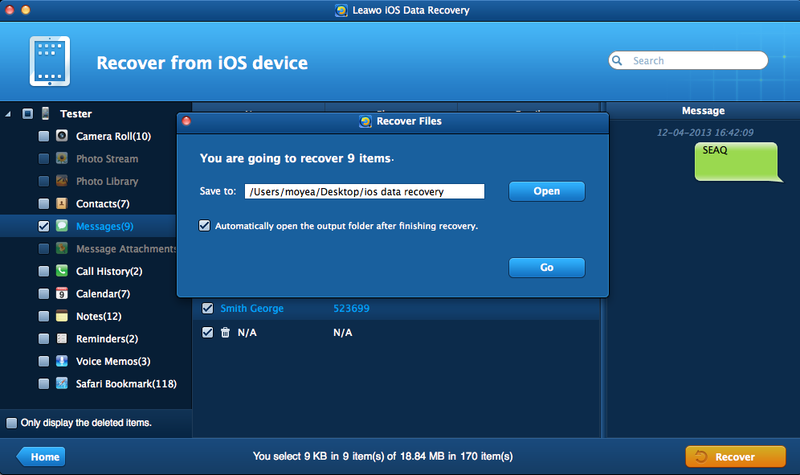 This software enables users to recover lost data from iOS devices, and extract files from iTunes backups. It also helps users to backup iPhone, iPad and iPod touch files to computer. When iPhone stuck one Apple logo, Leawo iOS Data Recovery may not be helpful, but when the users lose data before the iPhone is restored, this software will provide much help. Setting recovering deleted text messages on iPhone as an example, the following guidance will show you how to use Leawo iOS Data Recovery. You are allowed to free download the software to have a try, but note that the trial version will stop at the preview window. 1. 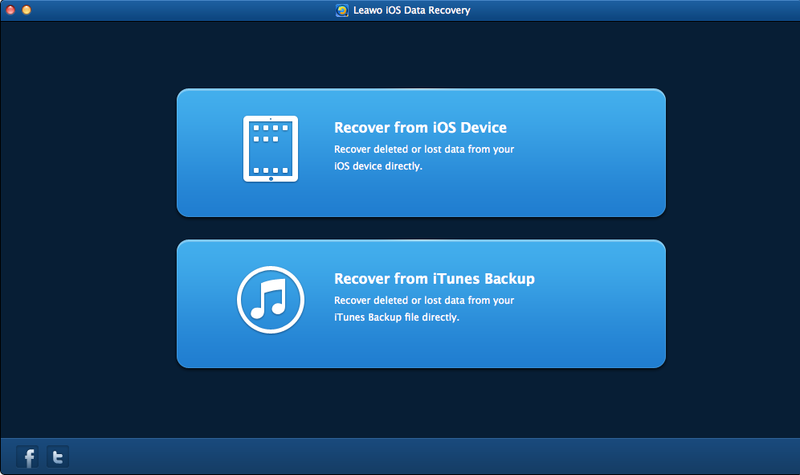 Start Leawo iOS Data Recovery, and you will see two recovery modes in the main interface, one is “Recover from iOS Device”, and the other is “Recover from iTunes Backup”. 2. Choose “Recover from iOS Device” and connect iPhone to computer with the USB cable. Click the “Start” button in the window, and then the software will start to analyze iPhone. 3. 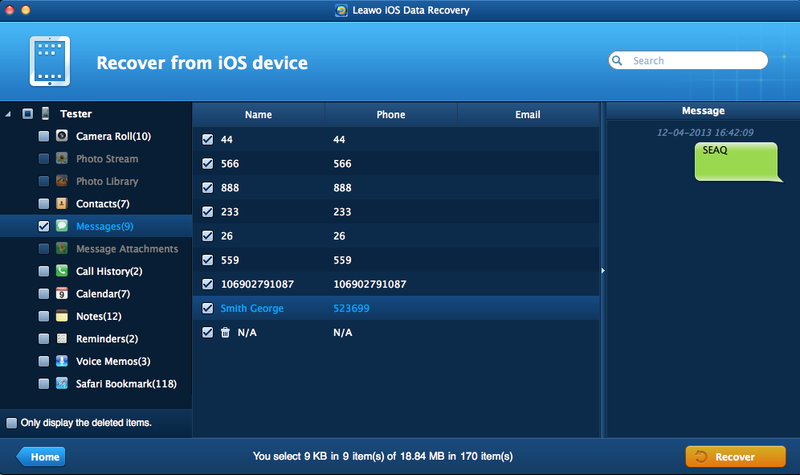 After the analysis, Leawo iOS Data Recovery will scan the contents in your iPhone. The software will list 12 categories in the left sidebar, and you can choose “Messages” when the scan is done. Check the messages you need and then click the “Recover” button at the right bottom. 4. After clicking the recover button, you will see a pop-up dialog. Click “Open” in the dialog to choose a folder on your computer to save the exported files, then click “Go” to start recovering deleted text messages from iPhone. When the recovering process is done, you will get the recovered text messages in the target folder. The recovered text messages will be saved in a CSV file and an HTML file, and you are able to view them on your computer. With Leawo iOS Data Recovery, users are able to recover deleted files with no efforts. This software also provides help for the data recoveries of other iOS devices, for example, you can recover deleted notes on iPod touch with this software. If you are interested in it, just free download it and have a try.